Karlsruhe/Frankfurt, 20 June 2018 | INTERGEO 2018 presents the ideal opportunity to explore key topics surrounding the digital revolution, smart cities and ever-advancing technological developments such as artificial intelligence and augmented and virtual reality. Tickets for the conference and trade fair are available now. Keynote speeches, panel discussions and industry-focused exhibitions will demonstrate the bright prospects for the future geodata industry. That’s why the smart city solutions section constitutes the focal point of the trade fair. An important partner in this respect is the Fraunhofer Institute for Industrial Engineering (IAO), which is working hard to address the subject and will give a keynote speech on the Wednesday with Alanus von Radecki to provide visitors with an expert insight. Smart traffic management by means of autonomous driving, digital urban planning, digital construction and property valuations are just some of the main focuses at the conference. Prof. Joaquin Diaz from the Federal Association of Construction Software (BVBS) and Prof. Harald Simons, member of the management board at empirica AG, will kick off the final day of the event with a keynote speech on these subjects. Looking at infrastructure measures, Ron Bisio from Trimble will give a keynote speech on building information management (BIM) and highlight the potential of state-of-the-art geospatial technology. Even now, vast amounts of precise and cutting-edge geodata are being collected. AI has the potential to make data capture and evaluation processes significantly faster, which will see construction procedures and traffic management undergo revolutionary changes in the future. AI planning expert Prof. Jürgen Döllner from the Hasso-Plattner Institute will open the event with a keynote speech focusing on the different uses of AI. Sensors, such as high-resolution cameras and scanners, that are being increasingly fitted onto unmanned aircraft (UAVs) provide large amounts of 3D data almost instantly. At the INTERAERIAL SOLUTIONS trade fair, exhibitors will demonstrate a wide range of UAV applications for users and operators of this smart flight technology. The visualisation of geodata is increasingly based on high-resolution, photorealistic virtual reality (VR) applications that exhibit state-of-the-art imaging and scanning processes. On top of that, there are augmented reality (AR) applications that enable users to directly access location-specific data that can be geographically and seamlessly combined with a digital 3D depiction of the area. 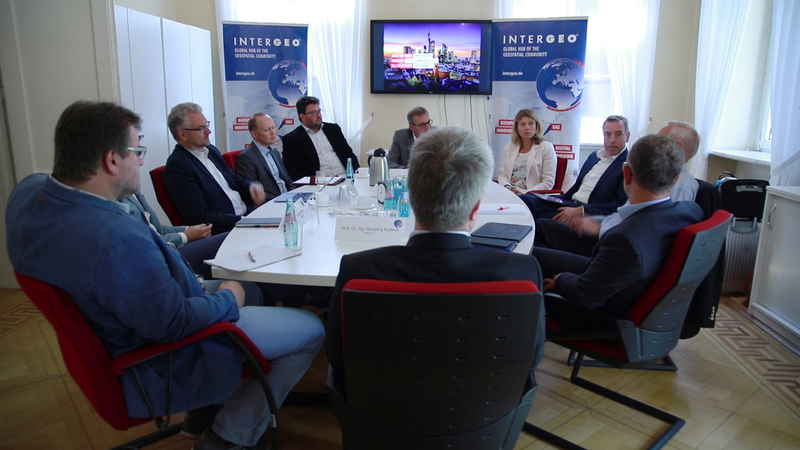 Some 600 exhibitors from 37 countries will show how all this and more is possible at INTERGEO. INTERGEO is the world’s largest trade fair for geodesy, geoinformation and land management and therefore provides a fantastic platform, forum and opportunity to network. The 2018 event will be held in Frankfurt am Main, Germany, from 16 to 18 October. Don’t miss out – you have until 19 August to secure an early bird discount of up to € 50.00 for each conference week pass!